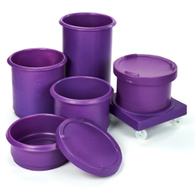 Virtually indestructible food and ingredients storage solutions. 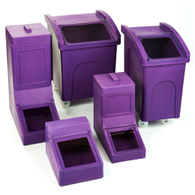 All KsPrism materials handling bins, trucks and tanks are roto moulded for maximum resilience and durability, designed to last in the harshest environments. 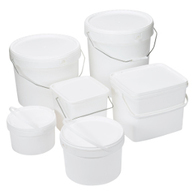 Proven not to split and shatter, that little bit of extra investment in your ingredient storage and food storage bins at the outset proves so much more cost effective in the mid to long term. 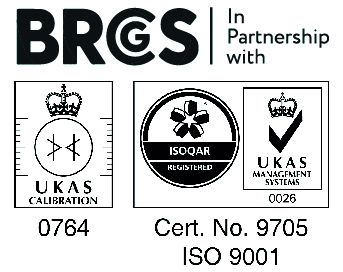 Resistence to most chemicals allows for the most effective cleansing without product integrity being compromised. 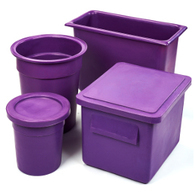 Available in all 10 KsPrism food contact approved colours, and UV stabilised for maintenance of colour brightness. 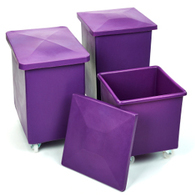 Among the most commonly sought materials handling equipment,our interstacking bins, lids and dollys are held in stock for same despatch to all delivery points in the UK and Ireland. 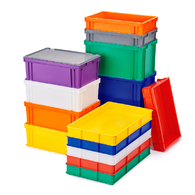 Call our specialist team today to discuss your food and ingredients storage and movement requirements - our extensive range of colour coded food grade food storage bins and plastic crates contains just the solution you are looking for. Special prices available for quantity starting at just 2 units - login or call 01473 461800 to discuss your specific needs and obtain a quotation.